The Spring Quartet is a super group of jazz musicians if you’ve ever heard one. Jack DeJohnette has been hailed as “one of the greatest jazz musicians alive.” Joe Lovano is a fearless grammy award winning saxophonist. 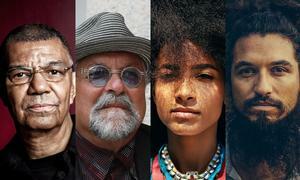 Esperanza Spalding is an outstanding and an ever evolving bassist, vocalist and composer. Leo Genovese is a wonderful keyboardist and composer.